Deploying real-time applications on multicores is challenging because tasks that are executed concurrently on different cores can interfere on shared resources, severely complicating worst-case timing analysis. To tackle this challenge, we propose a new scheduling model called isolation scheduling (IS): IS provides a framework to exploit multicores for real-time applications where tasks are grouped into classes. IS enforces mutually exclusive execution among different task classes, thus eliminating inter-class interference by construction. We assume that interference due to the statefulness of shared resources is either negligible or accounted for in the worst-case execution time of tasks. Mixed-criticality systems provide an example where IS is applicable. We propose and analyze two novel approaches for isolation scheduling: a global approach based on fluid scheduling and a partitioned approach based on hierarchical server scheduling, each with extensions to mixed-criticality applications. 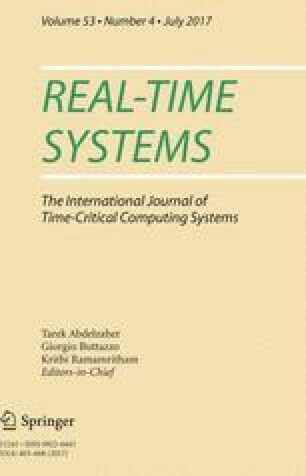 Through extensive simulations, we compare the two approaches in terms of schedulability and runtime overheads and quantify the schedulability loss due to the isolation constraint. Moreover, we conduct a comparative study among state-of-the-art approaches that comply with our IS model, showing that the new approaches can significantly outperform existing ones in terms of schedulability.